Below you will find clips of Director Terry Hasseltine on various programs and YouTube. For the latest video's on all things Maryland Sports, check out Maryland Sports' YouTube Channel. The news outlet of Maryland Sports- The Sports Commission for the State of Maryland. Maryland Sports - The Sports Commission for the State of Maryland - is now the official local spelling bee sponsor for the Scripps National Spelling Bee program across ten (10) counties and the City of Annapolis. As the host state for the Scripps National Spelling Bee broadcasted on ESPN, we are trying to grow Maryland's participation in this program to show our statewide support of such a fantastic event but also to engage more Maryland kids to participate on the national stage in OUR backyard! The opportunity to participate in a school-level bee to qualify for our local Maryland Sports Spelling Bee is a competition with a level playing field. All kids from K-8 are openly welcome to compete against one another in an open and inviting atmosphere. In addition to improving students’ spelling skills and increasing their vocabularies, spelling bee participation provides valuable experience in developing poise — a necessary skill for success in public speaking, performing arts and athletics. All schools- public and private- and homeschool students in Allegany, Caroline, Carroll, Cecil, Garrett, Harford, Kent, Queen Anne’s, St. Mary’s and Talbot counties and the City of Annapolis are eligible to be enrolled in the program at spellingbee.com. We have locked in the Early Bird registration rate of $151 for the rest of 2017 to spark registrations in these counties. Enrolling a school with the National office automatically enrolls the school/homeschooler in the Maryland Sports Spelling Bee. The winner of the Maryland Sports Spelling Bee will go on to compete in the Scripps National Spelling Bee in National Harbor, MD. 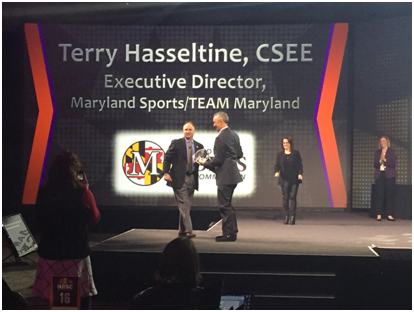 Terry Hasseltine, Executive Director of Maryland Sports stated, "We are honored to have the Scripps National Spelling Bee call National Harbor and Maryland home. We, Maryland Sports are humbled to work with the Scripps National Spelling Bee to enhance Maryland's youth K-8, to participate in this prestigious national/international event in our backyard. We have partnered with the Scripps National Spelling Bee to be the local host for 10 counties and the City of Annapolis. We openly invite all 238 schools and homeschoolers to participate in our qualifier event, the Maryland Sports Spelling Bee on March 18th in Annapolis. We look forward to cheering on our winner and all participants at the Scripps National Spelling Bee event Memorial Day 2018 at the Gaylord National Resort & Convention Center." If you are a parent, teacher, or PTA member in one of these communities you can register your school/homeschooler at spellingbee.com. For questions about running your school bee, go to spellingbee.com/contact where they can assist you. For questions specifically about Maryland Sports Spelling Bee, please contact Ashley Harper Cottrell via phone (410-223-4134) or email (acottrell@marylandsports.us). The Sport Tourism Executive of the Year award goes to a staff member of an NASC member organization which has exhibited the most outstanding impact in the sport tourism industry. This individual has positively impacted the industry through events held through economic impact, hotel occupancy, growth of sport in a local community, participation and/or attendance records. The 25th annual NASC Sports Event Symposium is being held March 27-30 at the Sacramento Convention Center. The NASC Sports Event Symposium is the annual meeting for the only non-profit 501(c)3 trade association for the sport tourism industry. For 25 years, the Symposium has been designed for serious-minded sport tourism professionals by sport tourism professionals. Copyright © Maryland Sports, All rights reserved.